Actus Digital records content, monitors closed captions, teletext, subtitles, loudness and SCTEs, and exports clips for compliance. The Actus Digital 2018 NAB Show exhibit will show the latest innovations for industry-standard compliance monitoring and media intelligence. The company will demonstrate and explain how broadcasters, MVPDs and OTT service providers can expertly manage multiple workflow tasks under the compliance umbrella from a single platform. The company's Compliance and Logging Suite is a self-managed solution that is simple to deploy and integrate, requiring a minimum of rack space and power requirements for enhanced total cost of ownership. 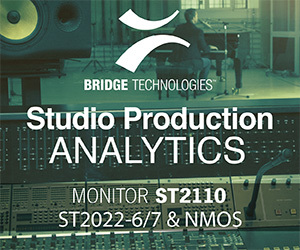 It streamlines the recording and management of content, clips creation and content repurposing, and export into one centralized, unified platform with a built-in multiviewer for monitoring and analysis of overall QoS. Actus Digital adds value with competitive and ratings analysis tools to understand the performance element, with rich data and statistics that amplify media and business intelligence for customers. Delivery solutions are architected as HTML5-based platforms to ensure unified experiences on any device. On the compliance side – the company’s bread-and-butter focus for NAB – Actus Digital addresses all FCC requirements including closed captioning, loudness control, multi-lingual audio, Dolby decoding, subtitle recording, SCTE, Nave and metadata extraction among other components.